I chose this as if you make yourself a clay oven in your forest school setting this would be nice to make and eat outside. Place the dried yeast in the lukewarm water and stir. Leave for 5 minutes. Put the flour in a mixing bowl and add salt. Pour in olive oil and the yeast solution. Mix into a ball and knead for 10 minutes until smooth and pliable. Lightly rub with olive oil and put in a bowl. Leave to prove for an hour, with a clean tea towel over the bowl. Punch down the pizza dough and divide into four equal portions. Roll each piece out into a thin circle. Young nettles washed and dried in a salad spinner. Some recommend blanching and draining and drying the nettles first but the texture of the fresh ones is good and the heat of the oven neutralises the sting. Just use gloves to handle. 200g Young nettle leaves washed and dried in a salad spinner. 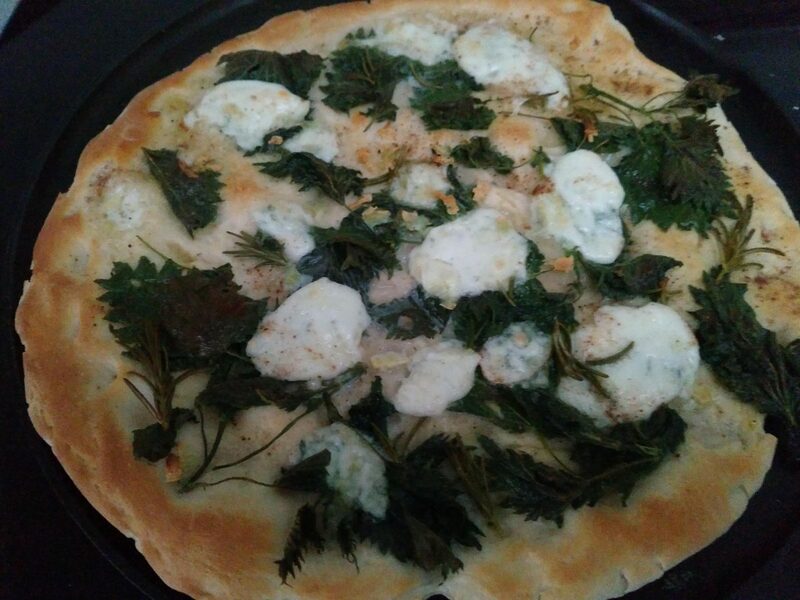 Some recommend blanching and draining and drying the nettles first but the texture of the fresh ones is good and the heat of the oven neutralises the sting. Just use gloves to handle. Mozzarella cheese buffalo or other depending on budget. Distribute the mozzarella across the bases. 3 .Grate parmesan on top. Place in the oven for 10-15 minutes until crispy. Shorter if using a pizza oven.